Automated Blood Donation is a unique donation process that efficiently and effectively separates blood components, allowing you to do more each time you donate. With Automated Blood Donation, less blood is removed per visit because only the needed components are used and the rest of the blood is infused back into the donor. This means that you can donate more, helping more people with each visit. 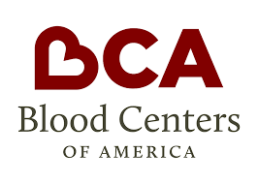 Cascade Regional Blood Services and you, together, can ensure the needs of receiving patients in our community are met efficiently and effectively. ARE YOU ELIGIBLE FOR AUTOMATED DONATION? If you meet the criteria for donating whole blood and your platelet count is above a preset threshold, you are likely a good candidate for automated donation. 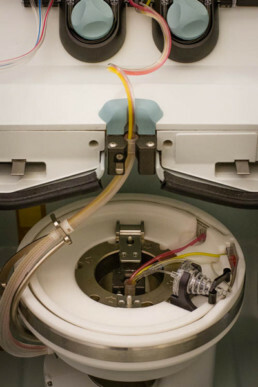 Automated donation by apheresis is the process of withdrawing whole blood and separating it into component parts (platelets, plasma or red blood cells) by spinning in a centrifuge. The needed components are kept and the rest is returned back to the donor. Platelets are stored at room temperature and placed on an agitator to keep the platelets from clumping together. They are also cultured to detect any bacterial growth and irradiated to inhibit the replication of white blood cells. Platelets have a shelf life of 5 days. 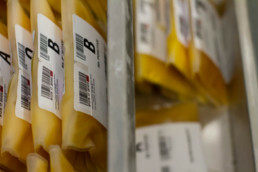 Plasma from automated donations is divided into individual units and frozen within 8 hours of collection to ≤ -18˚ C. Fresh Frozen Plasma, or FFP, can be stored for up to one year after collection. Plasma is couriered to the hospital in its frozen state and not thawed until just before transfusion. Red cells from automation are already separated from plasma. 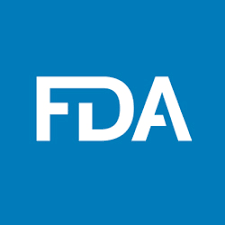 An anticoagulant/preservative is added and it is filtered to minimize any remaining leukocytes (white blood cells) to prevent transfusion reactions. Red blood cells are refrigerated and have a shelf life of 42 days. 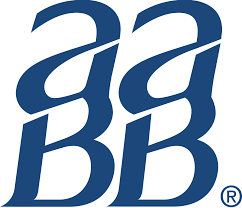 As with whole blood donations, all automated donations are subjected to the same rigorous pre-donation screening and laboratory testing to ensure the blood’s safety. 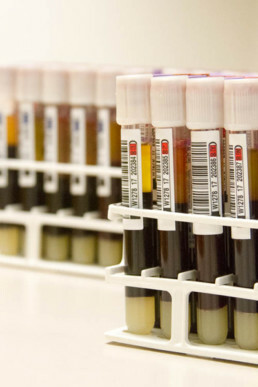 Please see our article, “What Happens to Blood After Donation” for a list of all laboratory tests performed on each donation. After your blood donation has completed testing and been properly labeled, it is stored in large refrigerators and freezers at CRBS. It is now ready for distribution to hospitals. The final step in your donated blood product’s journey is when a component from your donation reaches the right patient-typically within 10 days. Red blood cells are the most common type of blood cell and carry oxygen from the lungs to all body tissues. 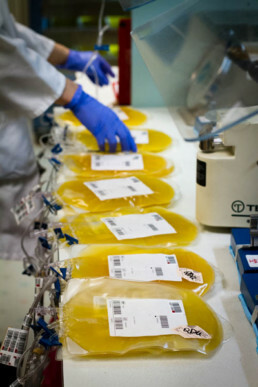 Red Blood Cell transfusions are routinely used for surgical and trauma patients. 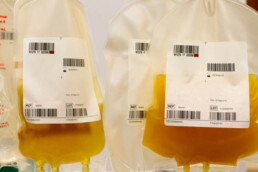 Other patients who benefit from red blood cell transfusion include those with anemia and those with blood disorders such as Sickle Cell Disease. Whole blood is most often separated into blood components but is used for infants on rare occasions as well as surgical and life support devices. Plasma is the liquid portion of the blood in which the red cells, white cells, and plasma are suspended. It consists mostly of water containing proteins, electrolytes and nutrients. Plasma transfusion is used to control bleeding during surgeries and trauma, and to treat patients with clotting disorders and major burns. Platelets are tiny cells circulating in the blood. Platelets gather at a bleeding site and clump together to form a plug that begins to seal the blood vessel. 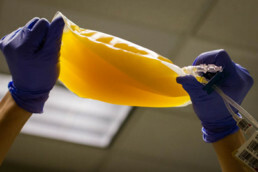 They also release substances that promote further clotting. Platelets are often transfused to patients with bleeding disorders, and to those undergoing cancer treatments and organ transplants.